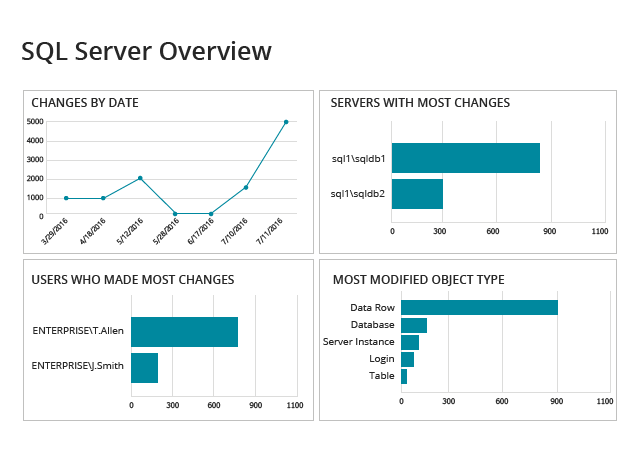 Many SQL database administrators (DBAs) use SQL Server monitoring tools to streamline SQL Server management, keep an eye on server performance, and perform server performance monitoring and memory utilization analytics. However, to truly secure your critical data, you can’t rely on performance monitoring alone, because it can’t protect against insider threats. Any improper or unauthorized database change or access event can wreak havoc, resulting in compromised information or database unavailability. SQL Server monitoring is critical to quick detection of performance issues that can jeopardize database usability and availability. Staying on top of performance monitoring helps answer such questions as, ‘Why did the database perform so sluggishly a couple of hours ago?’ and ‘What capacity constraints do we have?’ But what if one of your users deletes a table or changes permissions, or someone makes multiple unsuccessful attempts to access a critical database? Traditional monitoring of SQL Server can’t spot these threats to data security and availability; you need to complement it with proactive detection and blocking of emerging threats. You need to be confident that you are the first to know when instances are deleted or logins are performed without your authorization. You can’t see these security issues using only tools designed to track the performance of the servers. But wouldn’t you want to know about them? Netwrix Auditor for SQL Server delivers 360-degree visibility into what’s going on across your SQL Server, complementing your existing SQL Server database monitoring tools and built-in reporting tools such as SQL Server Management Studio. It goes far beyond what security issue solutions for databases can show you, so you can spot threats, investigate suspicious activity faster, and secure your critical data against privilege abuse, data breaches and system downtime. Strengthen database and data security by regularly viewing insightful reports and overview dashboards that help you stay abreast of all changes and access events, both successful and failed. Prevent privilege escalation by gaining visibility into permissions changes. Simplify reporting by subscribing to the reports you need most; you’ll get them automatically on the time schedule you specify. Track down the root cause of any aberrant action faster with the Google-like Interactive Search, so you can minimize the risk of database unavailability or a breach. Quickly spot and remediate insider and outsider threats with custom alerts on critical activity. Keep your SQL Server audit data securely for years in a two-tiered (file-based + SQL Server database) storage for future in-house investigations or audit checks.